In the previous issue, Barry Allen was continuing his quest to learn as much as possible about the new forces that were unleashed, when his world was shattered. Upon retuning to Central City, he is greeted by Booster Gold who informs him of the murders that happened at Sanctuary. Murders that included the original Kid Flash, Wally West. Now that we have the Flash title caught up with Heroes in Crisis, we get to see how Barry comes to terms with and deals with Wally’s death. However, the death of Wally is not the only thing lurking in the shadows waiting to tear Barry Allen down. When the reader opens the issue up, they are greeted by the one and only Bart Allen. Now that he has returned, Impulse seems to have one goal in mind: find his family. He runs into the house he expects the Allen’s and Wally to be in, but no one is there. As he wonders where they could be, we switch to Barry holding Wally’s Flash uniform at Sanctuary. Overcome with emotion, Barry takes off with the goal of breaking into the Speed Force to find Wally. Once he makes it into the Speed Force, Barry breaks down crying and calling out for his lost protégé. However, he is greeted not by Wally, but by another former protégé of his: Godspeed. August hasn’t been seen since Grodd attacked Central City again. We got a hint that Godspeed was working for someone else in order to be a better hero, but after that, he was gone. Now, he’s here attacking the Flash. When Barry asks what caused him to turn on Flash again, according to Godspeed, “I know how you think, Barry, so I know you won’t understand.” Once the two of them leave the Speed Force, Barry demands to know why Godspeed has abandoned his quest for redemption. Godspeed replies, “Haven’t you learned that yet? You can’t just say you want to be redeemed. That’s why I’ve made it my life’s mission to help clean up your mess…The future needs saving.” Despite Godspeed trying to sound like a misunderstood hero, Flash says that he’s never heard him sound as scared as he did in that moment. Back with Bart, he’s still searching for the Flash family. He checks the former home of Max Mercury, then Mount Justice and Titan’s Tower for his old friends. Meanwhile, at Iron Heights Penitentiary, Wallace and Avery (Kid Flash and the Flash of China) are visiting Meena (a former ally turned rogue by Grodd’s mind control). As Wallace begins to tell them about the Teen Titans and how he feels out of place with them, they are interrupted by Godspeed. When he reveals himself, we get a good glimpse of a blue gauntlet on his arm that he never used before now. When Barry tells him to stop, Godspeed brings up evidence from an old case they worked on together and that Flash needs to trust him. When Barry tells him that he’s not getting anywhere near the kids, Godspeed attacks the prison guards and channels lightning to shock Flash. He then grabs Meena and energy surges from her, leaving her unconscious. Kid Flash and Avery attack Godspeed, but he quickly overpowers them and drives an even bigger wedge between the kids and Barry. “Did Flash really not tell you? Wally West is dead.” With the kids distracted, Godspeed is able to grab them and seemingly absorb power from them like he did to Meena. This drives Barry to viciously attack Godspeed. When Barry sees the blood on his hands, he hesitates. Godspeed tells him “Someday you’ll see…I’m trying to warn you. Whatever you did…They don’t just hate you, Flash. They hate all speedsters.” Godspeed then takes a cheap shot and absorbs Flash’s power like the other speedsters. As he makes his escape, he is blindsided by Impulse. As Godspeed attempts to fight back, whoever has been pulling his strings tells him to avoid fighting Bart because he’s nowhere near ready for that fight. Godspeed escapes and Impulse continues his hunt for his lost friends and family. Meanwhile, Barry has recovered from the power absorption and sets out to check on the kids. He gets the two of them and Meena to S.T.A.R. Labs and ensures they are safe, then is quickly confronted by Wallace about Wally. After an argument, Barry returns to his and Iris’s house to break the news to her. He slows time as he arrives to see her one more time before she knows the truth. He then speeds everything up and tells Iris that her nephew is dead. When Iris hears this, she flies into a rage and demands that Barry find and kill whoever is responsible. She then collapses to her knees while Barry tries to console her, making the last image we see of the two, them on their knees crying. Bart ran to the Flash Museum to seek answers but finds that the timeline has changed since we last saw him before Flashpoint. As he puts it, “I can see inside the museum how much has changed. It’s all wrong. It isn’t just like time passed or people are missing. It’s bigger than that.” He then sets out to find his friends and runs off into the distance. Finally, Godspeed arrives at what looks to be a futuristic hall. He states that he hated having to betray Flash and that what he’s been made to do better be worth it. His mysterious boss tells him that he has been watching Flash and his allies. As Godspeed moves closer, we see monitors with images of Barry from multiple eras (Crisis, his return and Rebirth). He tells this boss that he was successfully able to collect Speed Force samples with the gauntlet. His boss replies, “Good. The Flash family will pay for what they did to me. What they did to my family. And by the time I’m finished…there will be no more speedsters.” The boss reveals his back below his shoulders, and we see a dark suit with blue details. What an issue. 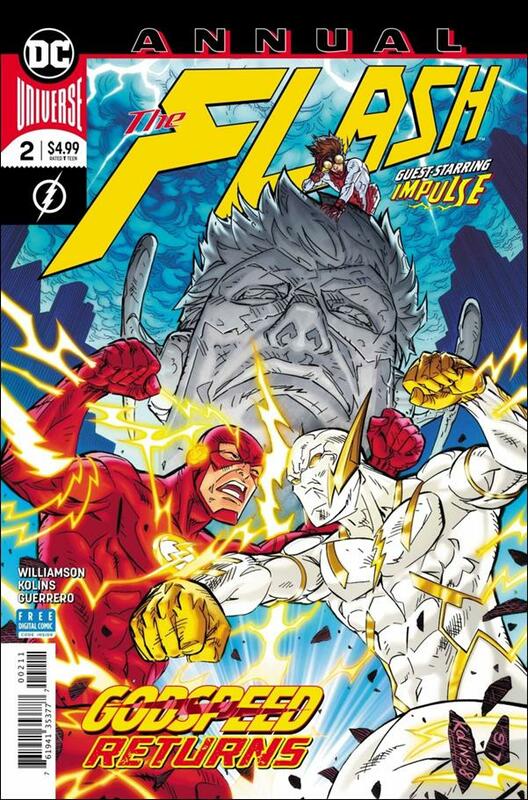 Honestly, this was probably the best issue of the Flash since Flash War happened last year. Now that Wally being dead is out of the bag, the series can keep up with Heroes in Crisis as the mystery unravels. Barry and Iris will have a long journey in front of them to cope and come to terms with the death of such an important person in both of their lives. With Flash’s inevitable heir gone, Barry will have to find a way to dig deep and keep pushing forward. Additionally, we had a glimpse of Godspeed’s boss that was previously teased. While I initially had hoped for the return of Savitar, my new guess is Cobalt Blue. Not just because of the new suit, however. His motivations and dialogue seem to hint at someone with a familial grudge against the Flash family, which would be a Thawne. Another reason this has me excited is because Cobalt Blue wouldn’t know the current Flash family as much, hinting at the return of characters like Jesse Quick, Max Mercury and (the one I’ve been waiting for) Jay Garrick. Thirdly, the best of this for me was Bart. Not only did he slap around Godspeed, he said he was going find his “friends”, and the editor’s note confirms it, he’s finding the other members of Young Justice. This firmly places the new Young Justice series in the main continuity of the DCU. That alone makes this issue a must-read for me. The last thing I’ll mention is Godspeed himself. I never liked the idea of him being a villain. At the very least, I have always seen him as an antihero despite the writers wanting him to be a villain from the character's arrival. To me, Godspeed needs to be the Red Hood to Flash’s Batman. In fact, once this arc is over and Godspeed helps Flash defeat his boss (it’ll happen and we all know it), he can join a new group of Outlaws with Red Hood. The basis of the revamped Outlaws at the beginning of Rebirth was to be a dark parallel of the Trinity of Batman, Superman and Wonder Woman. Once Artemis and Bizarro return, why not add a dark analogue for Flash to the mix? I see huge potential for amazing things from Godspeed, and I really hope that the writers see things the same way. With everything coming the Flash’s way, this series is about to go absolutely crazy, and I’m all in.